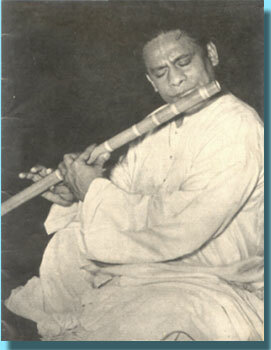 One of Pannababu’s significant contributions was that he gave the Bansuri an independent identity among the acknowledged traditional instruments like the Been, Sitar, Sarod and Sarangi. In his performances, he essentially rendered the Khayal Gayaki in its fullness. He played compositions set to such Talas as Jhoomra and Tilwada, which today is almost unheard of, by present day flautists. He then proceeded into Madhyalaya structures and finally the Tarana style, which afforded several elements of Tantkari including Jhala techniques, played on plucked instruments like Sitar and Sarod.